Among the odd and curious behaviors dogs do, trancing will always remain one of the most mysterious out there. Not all dogs seem to trance, but those who do surely leave their owners scratching their heads wondering what is going on with their canine companions. In some cases, dog owners may even be worried about their dog’s behavior as they wonder if their beloved dog is exhibiting some sort of odd seizure or if there may be some neurological or perhaps behavioral issue at play. Yet, many dog owners attest that when they have their dog seen by the vet, he turns out to being perfectly healthy and normal, other than exhibiting this odd dog trancing behavior! Trancing is known as being in a half-conscious state, somewhere in between sleep and wake. When we think of this state, we can’t help it but think about a state induced by hypnosis, meditation or some paranormal phenomenon such as a magical incantation or an out-of-body experience. We may also think of it as a state induced by taking some sort of drug that cause alterations in perception, mood, or consciousness. While we can imagine a person being is such state, its not that easy imagining a dog acting this way, yet, there are many dog owners reporting that their dogs start trancing when they are exposed to specific tactile triggers found in their environment. Also known as ghost walking or weed walking, trancing occurs when dogs move slowly in a trance-like fashion as they walk under low-hanging leaves, a bush, a Christmas tree, a long table cloth or under clothes hanging. What seems to trigger this odd behavior is the slight touch of something gently making contact with their skin. Dogs in a trance-like state will walk slowly and then may become very still or they may walk back and forth. Dog owners report seeing glazed-over eyes, but then once the dog snaps out of this state, the dog resumes normal activity as if nothing happened. How long do these trancing episodes last? According to Black’s Veterinary Dictionary, anywhere between a few seconds to longer than half an hour. Interestingly, bull terriers, basset hounds, greyhounds, Jack Russell terriers and salukis seem to be more prone to this behavior compared to other breeds. They say seeing is believing, so we are posting a couple of videos for those skeptics out there! Often dog owners wonder what they should do when they notice the trancing behavior. Asking the dog to do something else might work to help the dog snap out of it, but affected dogs may not be responsive as they normally are and some dogs may even appear irritated when interrupted, explain D. Caroline Coile and Margaret H. Bonham in the book “Why Do Dogs Like Balls?” Letting the dog be therefore may be the best solution. Many dog owners are rightfully concerned as they wonder if trancing may stem from some underlying medical problem such as a neurological or behavioral issue. 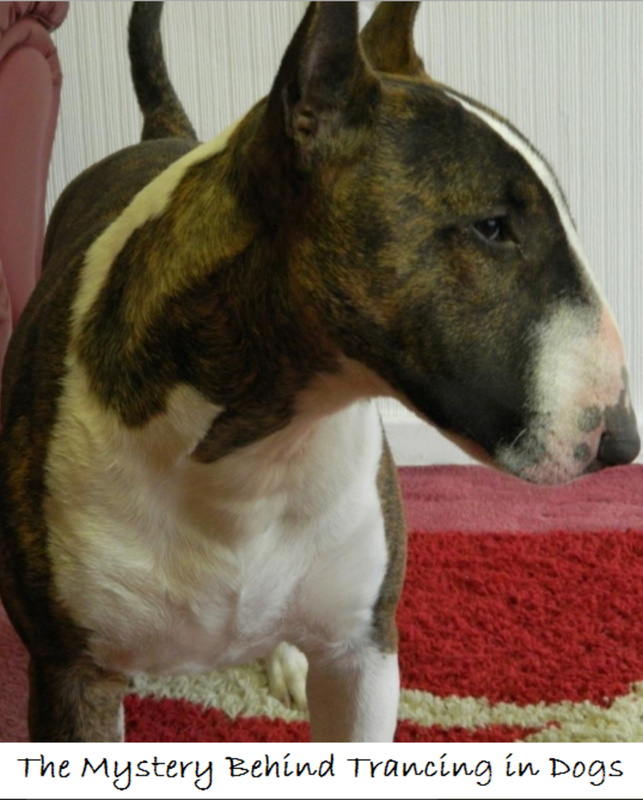 The Bull Terrier Neurological Disorder Resources website conducted a poll back in 2004, collecting data from owners of bull terriers. The poll results showed that 86 percent of the dogs were considered normal while 14 percent were showing neurological issues. Out of these normal dogs and dogs who had neurological issues, 73 percent would trance while 27 percent would not. Alice Moon-Fanelli, a Certified Applied Animal Behaviorist with an interest in the behavior, has noted that a large amount of bull terriers trance, but has found no connection with tail chasing, a behavior common in this breed, thus, she claims that trancing should not be considered a precursor to tail chasing behavior.